If you make a serious effort into sending your enemies in from multiple sides going as far as to have them leave the map and come back, then RAW overwatch might work. I'm working on a proper response to this development, but I've been really busy lately. Effectively, you just have to drop enemies right on the party or make all your combat occur where the enemy is going to be attacking from multiple vectors at the same time to balance overwatch. I did basically confirm that it was inspired by Space Hulk (board game) overwatch, which works well in that system. I may give it a go and see what happens...I am not expecting good things. It may make actions such as assaulting down corridors more furious though? I guess we'll see, it'll be another couple of months before I run a game again. As it stands I'd have to change a lot to accommodate overwatch as is, if the players used it regularly and jealously. I'd probably get more complaints about awareness checks though constantly dropping foes on my party. You just have to design combats so as to abuse the limitations of the arc. There is also this thing I created called the running charge. I'm not 100% on its legally, but basically you fire enemies at the front line using run moves specifically to break overwatch. It's effectively a very risky charge, but the run confers a -20 hit. You just know the guy will get punked in combat the next turn, but that's not the point. The point is to lock down the overwatcher. As far as I understand it the "problem" with Overwatch is that it breaks action economy vs. large numbers of enemies. Why wouldn't or shouldn't those enemies take advantage of their superior numbers in order to counter the effectiveness of the "problem" rules? Drawing the fire of someone covering an area and jumping on him so that your allies can advance in safety is a solid, if suicidal, use of the resources at hand (i.e. lots of mooks). I, personally, don't have a problem with Overwatch. For me, it does the job it's supposed to. I can see why others might consider it broken, I just don't agree; I think the rule works as intended without houseruling or engineering bizarre scenarios. Where it doesn't do the job it's intended to is when someone is looking for a different style of play than the game is, I think, designed to accommodate. Space Hulk is an entirely different game from Dark Heresy. It's a game I adore, but as the same time it's very much its own thing. I would suggest that like you said you can increase enemy numbers to counter overwatch. This is another theory. The problem with this is that should the overwatch fail in some way you create a combat that is otherwise unwinnable. If it works very well you create a pointless combat. That single dominant burst of shots becomes very determinate, and that's a problem when you are scaling encounters. It's an element of extreme uncertainty. I'm not sure how you are using overwatch as we all have our own style of GM-ing and encounters are not particularly standardized in the campaign books. My suggestion is though that people defending it probably are not observing it regularly or have overruled certain aspects of its application. I would ask you to explain it to your players next session in complete detail, and just see what happens. Make sure they understand they can set it to trigger off both movement and shooting and show them how to draw the arc. Make sure that you are having them use the pin tests. It's extremely dominant when you know what you're doing with it. Also lets be honest ... jams and fate points. I'll take the shot almost every time. I'm not sure how you are using overwatch as we all have our own style of GM-ing and encounters are not particularly standardized in the campaign books. I run Overwatch completely by-the-book, pinning and all and don't have any problems with it. It works the same for both PC and NPC alike and several encounters have come to an Overwatch "deadlock" where neither side is willing to make the first move. Characters are forced to think a little more creatively than "Hurr, I shoot 'im" or "I charge, Rarr!". When Overwatch is being employed; use of grenades, distraction, misdirection and cover become more important than having the biggest gun or highest Ballistic Skill. This is not to say that Overwatch is used all the time; it's frequently impractical or straight up worse than taking a different option; you can't Aim or make a Called Shot, for example. P1: "I Run into the kill-zone"
Overwatch NPC: Takes the shot at -20BS. Hits, misses, pins or not...it's irrelevant. P2: "He's taken his one shot, guys! Get 'im!" ...every. single. time. Not an exact transcript of events, but you get the gist. With Overwatch being as good as it is, you have to weigh the risks a little more carefully because even one guy entrenched and ready for you is a significant threat to a much larger party and should be. I'm going to agree that I've reduced its utility. That was the point of getting overwatch inline with the action economy. Under my system it becomes in many ways a very situational choice when weighed up against taking a 'delay action'. The point of what I did was to reduce the power of overwatch to destroy whole units in a single turn in order to bring the threat values into line; to create a better expression of high risk/high reward and low risk/low reward. The person running the overwatch will still very likely get shot. I certainly agree with you that low risk/high reward can be quite common in real combat. It doesn't make for a great game though. In the cases I observed and the playtests overwatch caused several shooting players to become extremely dominant to the point that the rest of the party became useless. Designing around overwatch with ideas from you guys I could now probably reduce its power. I'd also likely reduce the threat value of close combat only enemies commiserate with how far they start away from the party. In the cases I observed and the playtests overwatch caused several shooting players to become extremely dominant to the point that the rest of the party became useless. And really? A series of narrow corridors/streets like that is an awful place for Overwatch. Plenty of "backdoors" and easily blocked line-of-sight. Sure you can't weeny-rush someone from one direction, but a single smoke grenade tossed around the corner from a place of safety renders Overwatch completely ineffective. If that grid-pattern is a city-block, then attacking from higher ground is also an option, or if the Overwatcher has the higher ground then stealthing him from outside his LoS is possible. I can't imagine many scenarios where an Overwatcher will truly dominate a grid like that. The ideal Overwatch position is an elevated pill-box (e.g. a tower or wall) in open terrain. Wide field of fire, clear LoS, protected or no "backdoor". Smoke needs to be very accurate to land inside the pill-box itself (and possibly launched rather than thrown if the tower/wall is high enough), but can be used to advance at the cost of your own vision. I was actually trying to imply that a crowded battlespace is good for an enemy that is trying to get around overwatch. The ideal overwatch arena is just as you said a pillbox. Ah, my bad. Misinterpreted your meaning. It's all good. I tend toward a lot wide open space in my maps and hand to hand only enemies. If I was running equivalent enemies with a lot of cover, troopers with autoguns and grenades for example who also made use of overwatch a lot, then I probably wouldn't have the issues with overwatch that I have outside of it bogging combat. Most of my theory on how to setup encounters is derived from XCOM:EU, and you can see the lengths Firaxis devs took to avoid overwatch spam and overwatch deadlocks. I want movement to occur even if it is slightly unrealistic. I've just observed a few situations in my games personally whereby one or two players have spammed out a lot of shots very quickly and effectively broken encounters. It obviously gets silly when you have snipers picking off entire squads before they close. I wouldn't mind as much if it was machine guns. You can obviously call that a failure of encounter/map design, but it's also a failure of the system when there is some arbitrary difference between overwatch and standard shooting in that one spams out twenty shots in ten seconds, whereas the other one can only spit out one shot in ten seconds. If there was a huge accuracy penalty, XCOM:EU, then I would accept it, but in stacking up the value of multiple shots vs. the penalty i'll generally pick overwatch every time. It obviously gets silly when you have snipers picking off entire squads before they close. I agree that it's something of a failure of the system that there's a disparity between what is possible using two different options. However, I think the success of the system lies in the abstraction. An odd statement to make of a system that is otherwise very granular, but it's the primary reason I support the written rules for Overwatch. You don't charge a machine gun nest, you don't run into the open when you know there's a sniper covering the area and you don't "make a move" when someone has a gun pointed at you. Overwatch being stupidly, brokenly good encourages the player to think like their character and really appreciate the advantage of "having the higher ground", so to speak. It's a part of the game design, in my opinion, that things aren't supposed to be fair and balanced and the Overwatch rules exemplify this mindset. Bring a knife to a gunfight and you'll end up in hospital. Try to wrestle an Ogryn and you'll get your arms broken. Try to charge down a corridor that's covered by three cultisits with autoguns and you'll go down in a hail of lead, no matter how many of you run around that corner; they have the advantage and you're going to have to solve the problem some other way than "CHARGE!". So in the example of the Sniper picking off an entire squad in one turn before they can close, the point is not that the rules are broken, but that the squad shouldn't have been trying to close in the first place; they should have been diving for cover thinking "Throne! That sniper's got us bang to rights. What now?". If the Overwatch rules are balanced with normal action economy, charging the sniper is a viable option and there's no reason the squad shouldn't do it, from a gaming perspective. If the Overwatch rules are broken, though, the squad of guardsmen don't charge because it'd be suicide; they act in a manner appropriate to the circumstances. If you want to play a style of game where charging the sniper is or should be a viable option, then that's your prerogative, but it's not the default assumption of the gaming style the designers, I think, intended. It really just comes down to encounter design differences. I'm confident that if I looked back at some encounters I designed in the past I could make un-nerfed overwatch 'fair'. There would just be a lot more terrain, tunnels, and other such tricks to get around the overwatch. Other encounters would need to be very much adjusted. I'd need to allow for that 'free scatter' that you see in XCOM:EU that players hate to avoid 16 shots on 4 guys as they scatter. You've also got be very careful about keyholes. My players tend to use the map as pictured and get very upset when something on the map doesn't represent something in reality, if they have been banking on it for many turns. Remember, you're talking to the guy that made the Normandy beach maps. No PC would ever survive Normandy with an un-nerfed overwatch. No PC would ever survive Normandy with an un-nerfed overwatch. 1) Overwatch doesn't mean you auto-hit. 2) You can pass a Pinning test. 5) Assaulting a fortified position head-on is possible, but generally not considered a great plan unless you have no other option. There's a reason for this. A Normandy style assault is pretty much the definition of a suicide run. If you've got lots of people, some will eventually make it through, but the odds of any given person or group of people surviving are and should be very very slim indeed. As I said before; if you want a style of game where such things are possible, that's your prerogative, but the game design as written has a much more lethal focus. Call it unbalanced, unfair or broken, as you will, but that's the intent I glean from my interpretation of the rules. There are a lot concessions we all make to the functionality of the game we want to run. Don't get me wrong I'm down with simulations. I play a lot of Combat Mission in my spare time, which treats overwatch the way that you would like. I'm mainly concerned with keeping the flow of the game functional and able to handle large combats without resolving 10 shots per NPC. You can't have any kind of mission where the party is defending a line function without confronting the reaper that is overwatch. The Normandy mission had a lot of special rules. We knew we were doing. There were also more troops on the beach. I had to re-shoot a lot of the pictures and they had been moved off the page in the interim. We also decided that those heavy stubbers would be mysteriously empty when the cliff was taken to avoid them breaking the next three instances. I'm gonna hold off for now and try it RAW. Whilst I've been using our generally agreed house ruled variant, I feel that playing it RAW might force my players to be a bit more advanced in their tactics. Rather than use one guy to draw their fire and the rest default to aim and attack, perhaps now they'll need to lay down smoke grenades, use tactical advance and where possible, suppressing fire to keep their enemy's heads down. Breaking the action economy seems like a minor price to pay I think. Alas, I imagine it won't be until the later half of July that I get to try. Having overwatch in the game just means that you have to setup your encounters around the idea that overwatch exists. For example, in a previous game there were a bunch of guys hanging around a lift and the party ambushed them. They were clumped up because that's how the story suggested they would be. If overwatch were still in play in that game they all would have died. This is realistic, but catching an enemy unaware doesn't make a good encounter. You've got to have your NPC enemies post guards. You're also going to take flack from your party when they start moaning about stuff popping out of the walls and floors. XCOM:EU solves this problem with something the players hate. SKIP TO 1:38 to see an example. In this situation enemies scatter to defense positions as soon as they are spotted as a 'free move'. This effectively cancels the first round alpha strike that makes games with overwatch in them somewhat hard to balance. I do think overwatch is cool. It just forces you to pull punches a lot more often. For example, in a previous game there were a bunch of guys hanging around a lift and the party ambushed them. They were clumped up because that's how the story suggested they would be. If overwatch were still in play in that game they all would have died. This is realistic, but catching an enemy unaware doesn't make a good encounter. You've got to have your NPC enemies post guards. You're also going to take flack from your party when they start moaning about stuff popping out of the walls and floors. Heh, it's a stylistic choice, but I like this sort of encounter being tough. If you're infiltrating a base and the lift is the only way down, then my immediate reaction as a player would be "let's not all stand in plain view in the lift...that sounds like a good way to get shot." Pressing up against the walls, sending the lift down and climbing down the shaft or using an alternative entrance (ventilation ducts, sewers, a laundry chute, whatever), hiding on top of the lift...just some ideas off the top of my head. Without knowing the specifics of the scenario, I can't say which, if any, would work, but it's the kind of thing I think should be inherent to a DH game. The front door is usually not the most ideal way in! If it's a true ambush; i.e. the PC's have absolutely no idea that someone is waiting for them, then that's still part of the intended encounter design; they're supposed to be taking a bit of flak at that stage of the campaign and it's then up to them to deal with it; wither by taking the flak or thinking their way around it. It's also worth bearing in mind that Overwatch isn't an "instant death" sort of deal. Yeah, you can get unlucky, but the PC's always have the advantage; namely Fate points. On top of that, they tend to be slightly more competent than the average foe, so to avoid "easy mode" it's important to remind them of their mortality every now and then. Overwatch is one of the few ways to do this without simply ramping up the deadliness of their foes, which can get a little silly quite quickly and break suspension of disbelief. Cultists -> guards -> elite guards...this is fine, but where do you go from there? Chaos Space Marines? Daemons? Xenos? They're all options for sure, but it's also nice to remind the PC's that even a lowly conscript can be a threat if he's got the advantage. I don't think Overwatch forces you to pull punches; for me it gives you the option of offering a threat with otherwise unthreatening enemies. It allows you the option of swinging full strength and that strength actually being a threat. This obviously doesn't lend itself to the gung-ho action movie style combat that many players enjoy, where the PC's wade through armies of mooks Commando style, but I've never seen DH as that kind of game. Look, Overwatch isn't the be all end all of encounters unless the Gm is doing it wrong! I once played in a game where the Gm's Idea of setting up encounters always amounted to: The enemy advances across the field/room/hallway towards your position. What do you do? Needless to say, this ended up with a lot of slaughtered monsters but it also got fairly boring pretty quickly! Remember that overwatch requires awareness of your target. Stealth, Smoke grenades and Tactical advance can all defeat it! As Gregor pointed out, Using overwatch both offensively or defensively forces the players to think tactically. Really GOOD players will also seek to keep their subtlety high so the bad guys won't know they're coming! (Can't set overwatch until you're actually in combat) Also remember that you can not use actions such as Aim since overwatch once set is outside of normal action economy and any other action other than firing ends it! Another point is that enemy tactics will change as well! While a mob of Orc boyz will likely charge across the field to attack I highly doubt that a group of Dark Eldar would do the same! I agree it isn't the be all and end all, but it's a huge part of how a lot players and NPCs should be, under the logic of jealously protecting their interests, using their turns. It's a core mechanic right next to 'standard attack', 'charge' and 'dodge'. It isn't something like 'defensive stance' or 'faint' that are rarely used outside specialist characters, but it occupies this weird area. It's also a part of the game that according to my statistics is highly misunderstood. 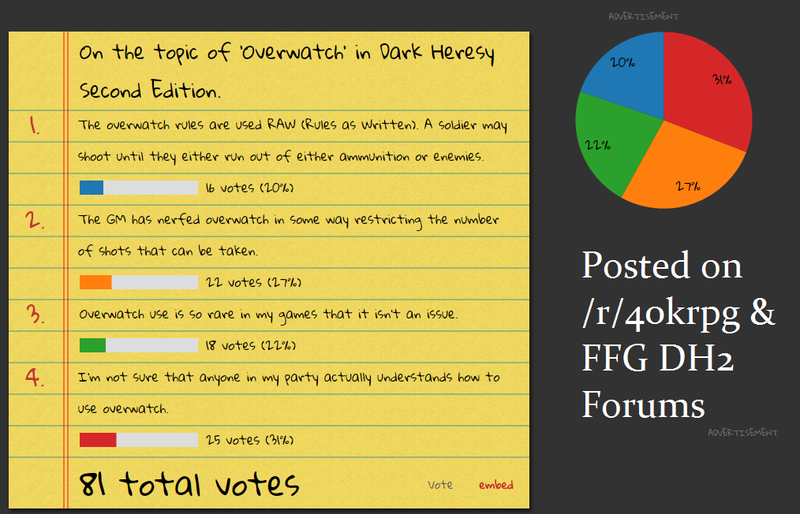 Overwatch however you use it is a controversial issue and it's important to sort out where it stands. I have some friends discussing the 2nd Edition Warhammer Fantasy RPG, and I realised something... Overwatch in the current incarnation would work wonderfully in that system. Given the few weapons with multiple shots tend to be dangerous to the user as well as the enemy, it's a good risk/reward for picking up a weapon that can do it.